Seattle is a hiker's playground with an abundance of towering mountains in almost every direction. There are multiple hikes that can be easily done in a day just out of Seattle. There's no better time than now to enjoy the long summer days and appreciate the incredible accessibility that this city provides to outdoor explorations. Here's how you can fit in three hikes in one weekend. Friday afternoon, head out to Oyster Dome in Bellingham. After getting off I-5, make your way to the beautiful Chuckanut Trail that offers you glimpses of the ocean hiding behind the trees. The trailhead is not marked well, and it's easily missed. Once you start the 3-mile hike, it gets steep rather quickly. Watch out for roots and some smaller creeks going down the hills. Then the trail flattens long enough for a quick view of the San Juan Islands. 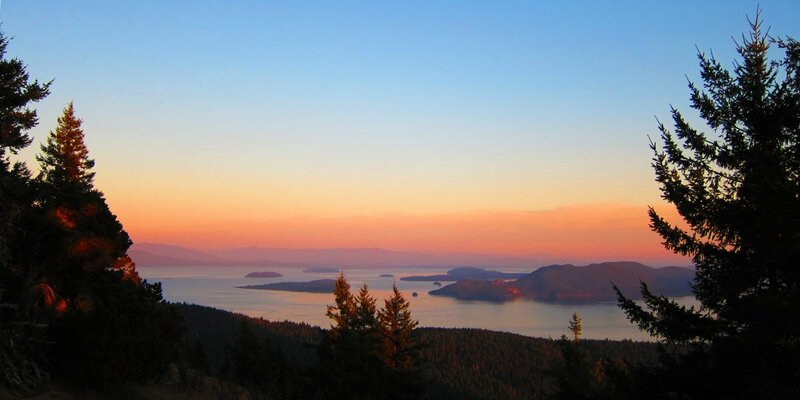 The top of this hike rewards you with stunning views of the San Juan Islands and Vancouver Island in Canada as well. Enjoy watching the sun to set over the ocean, and then begin your trek back down the mountain. Sunset view from Little Summit from Mount Constitution. Photo by Shane Kucera. On Saturday, Mount Constitution on Orcas Island is the destination for the day. Pre-book your ferry spot and relax as the ferry cruises through the San Juan Islands. Once on Orcas, drive around the U-shaped island to get to the mountain. Start on the Cold Springs Trail and begin the 4-mile hike to the top. The beginning is relatively easy, with a few small hills. Save your energy, as the last mile is full of switchbacks. Once you make it to the top, enjoy beautiful views of the San Juans while munching on your lunch. On Sunday, drive 45 minutes east of Seattle to Mount Si, the hardest hike of the weekend. At 8 miles total, the first mile alone has a 900-foot elevation gain. The trail evens out for a short period of time and allows you to catch your breath. The trail steepens again until you reach the top, where you'll reach 3,900 feet of elevation. The views of the Olympic Mountains and Puget Sound are well worth the effort. You'll feel like you've had a good workout and a great weekend in the woods after these three hikes.